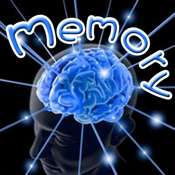 Memorinfinite is a puzzle game,which can improve players' memory .When the game starts,there appears several random pictures. The player needs to memorize the location of the pictures within the limit time ,and the pictures turn over when the time stopped. Then , drag the picture to the corresponding place.The next level will be continued until all the pictures are matched,and the game will be over when fails more then three times.The free version of this game has 4 levels waiting for you to challenge.